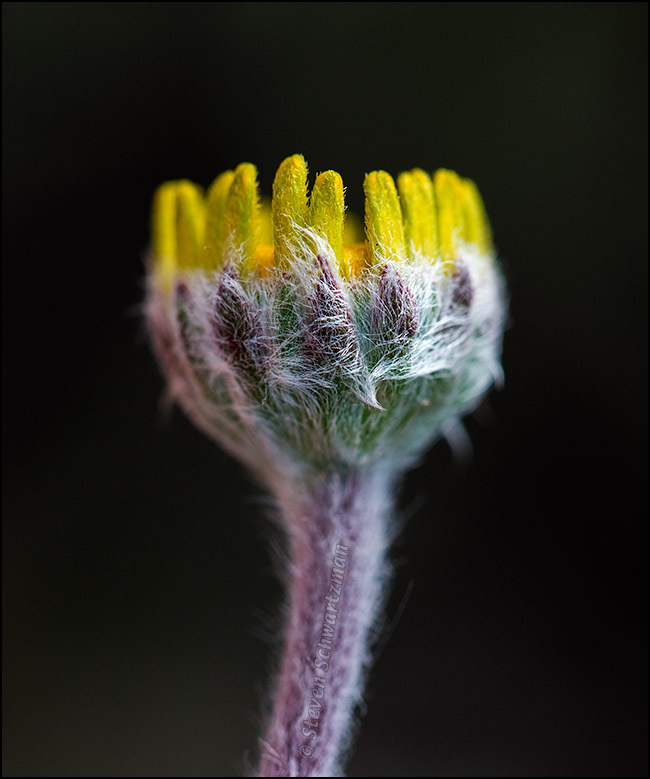 Very different from a phlox bud is the bud of a four-nerve daisy, Tetraneuris linearifolia. Trying to decide whether downy or pilose best describes it amounts to splitting hairs, but either way, I took this picture of a bud beginning to open on an undeveloped property at the intersection of Old Spicewood Springs Rd. and Spicewood Springs Rd. on March 24th. A picture last year of this species in this stage led to a comparison with man-made structures called crenels and merlons. This is the fourth and final post in the current series showing buds. Tomorrow it’s on to something quite different. The background is even natural, too, coming from shaded trees that were a lot darker than this sunlit bud. Danke, Mathilde. Also ist die Natur. practically left me speechless – wow! It’s good to begin the week with a “wow,” Jude. Thanks. Neat. It looks unreal. I like the crenelations. Is there a tiny castle dweller inside the wall? I find that getting very close makes lots of things look unreal, or hyperreal—and yet that’s the reality, even if we don’t see normally it with our unaided eyes. I often find dwellers on flowers in the form of insects and spiders, but I don’t recall seeing any on this opening bud, which still doesn’t mean there wasn’t one. The closeup views are always interesting. It looks downy. Does it feel downy? Lovely to see different views of this little daisy. I like to show, when possible and often spread over time, various stages in the life of a species. This species is common here, so my project is easy. With rarer plants, I take what I can get. A good word, florilegium. It’s the Medieval Latin gloss of the ancient Greek original, anthologia, literally ‘flower gathering,’ used metaphorically. It is a good word and one that seems to be creeping back in to use. As always, your close-ups are amazing Steven! I aim to please, Tina. It’s a fine sight, isn’t it? I could say it leapt right out at me. What a name Steven, I wonder where that one came from? I love this. Stunning Steven. At f/5 and pretty close to my subject, there’s not much depth of field, so I took advantage of that and kept the closest parts of the opening bud in focus. I’ll agree that this one has “curb appeal,” as they say in real estate. Thanks for seconding the wow. but it comes from the heart of my eyes. I like your original way of putting it: the heart of your eyes. Thanks again. It looks like the place that Horton heard the Whos! Great shot, textures and detail. Love it. Thanks. Based on the comments, I could say it’s the place that Schwartzman heard the wows. All four portraits of these buds have been delightful. I can imagine them grouped in a single frame, with the photographer’s signature on the mat. Of course, this one could hang alone in the Elisabet Ney, with a little commentary alongside on the similarities in structure between the flower and the museum’s architecture. Those are both good ideas. If I really got going on buds, I could have an awful lot of pictures in a very large frame. I’m glad you reminded me of the Ney Museum, because I haven’t been by there yet this year to see how the prairie restoration is doing. Every time I’ve gone, I’ve come away with some good photos. I love the details! Really beautiful picture Steve! Thanks, Michael. These little daisies are great to photograph at this fuzzy stage—and other stages, too. I haven’t heard the expression “grow my field.” I’ve been letting nature grow fields for me, and then I take pictures in and of those fields. Okay, I know that’s not what you meant, but that’s what popped into my head. In any case, I’m glad you find this picture fascinating and exquisite. Good, that picture reveals both kinds of fields. The larger one is clearly growing, but I don’t know about the other one. That’s a nice pairing of adjectives.